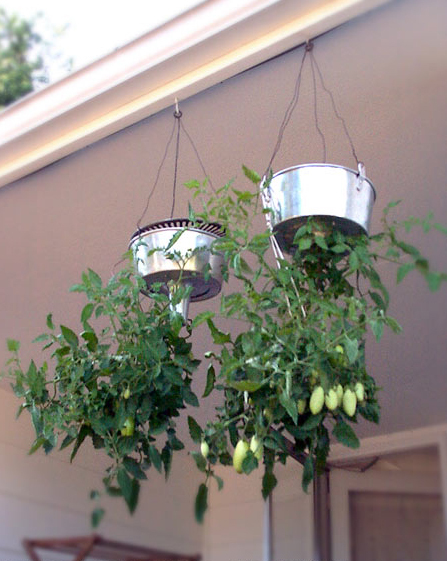 Growing crops that dangle upside down from homemade or commercially available planters is growing more popular, and its adherents swear they’ll never come back down to earth. “I’m totally converted,” said Mark McAlpine, a body piercer in Guelph, Ontario, who began growing tomatoes upside down two years ago because cutworms were ravaging the ones he planted in the ground. He made six planters out of five-gallon plastic buckets, some bought at the Home Depot and some salvaged from the trash of a local winemaker. He cut a two-inch hole in the bottom of each bucket and threaded a tomato seedling down through the opening, packing strips of newspaper around the root ball to keep it in place and to prevent dirt from falling out. He then filled the buckets with soil mixed with compost and hung them on sturdy steel hooks bolted to the railing of his backyard deck. “Last summer was really hot so it wasn’t the best crop, but I still was able to jar enough whole tomatoes, half tomatoes, salsa and tomato sauce to last me through the winter,” said Mr. McAlpine, who plans an additional six upside-down planters this year. Upside-down gardening, primarily of leggy crops like tomatoes, cucumbers and peppers, is more common partly because of the ubiquity of Topsy Turvy planters, which are breathlessly advertised on television and have prominent placement at retailers like Wal-Mart, Walgreens and Bed Bath & Beyond. According to the company that licenses the product, Allstar Products Group in Hawthorne, N.Y., sales this year are twice last year’s, with 20 million sold since the planter’s invention in 2005. Not to be outdone, Gardener’s Supply and Plow & Hearth recently began selling rival upside-down planters. “Upside-down gardening is definitely a phenomenon,” said Steve Wagner, senior product manager for Plow & Hearth. While there are skeptics, proponents say the proof is in the produce. Tomato and jalapeño seedlings sprout from upside-down planters fashioned out of milk jugs and soda bottles that hang from the fence surrounding the Redmond, Wash., yard of Shawn Verrall, a Microsoft software tester who blogs about gardening at Cheapvegetablegardener.com. Mr. Verrall turned to upside-down gardening last summer as an experiment. While horticulturists, agronomists and plant scientists agree that pests and blight are less likely to damage crops suspended in the air, they said they are unsure whether growing them upside down rather than right-side up will yield better results. “Growing things upside down seems like a fad to me, but I’m glad people are fooling around with it and hope they will let us traditionalist gardening snobs know what we’ve been missing,” said Hans Christian Wien, a horticulture professor at Cornell University in Ithaca, N.Y.
Judging from gardening blogs and Web sites, those fooling around with upside-down gardening are generally enthusiastic, particularly if they have planted smaller varieties of tomatoes. “Bigger tomatoes are too heavy and put too much stress on the vine, causing it to twist and break,” said Michael Nolan, an avid gardener in Atlanta and a writer for Urbangardencasual.com, who has four upside-down planters also made out of five-gallon buckets in which he grows bushels of cherry and patio varieties of tomatoes as well as small pickling cucumbers. When Mr. Nolan first tried upside-down gardening, he used the Topsy Turvy planters, which are made of polyethylene bags and look like Chinese lanterns gone wrong. But he was disappointed in the yield. “I far prefer using buckets,” he said, which hang from tall metal shepherd hooks bolted to the posts supporting his backyard deck. He paints his buckets bright colors, and plants herbs and marigolds in the top to help retain moisture. Many gardeners reported that the thinner, breathable plastic Topsy Turvy planters ($9.99) dried out so quickly that watering even once a day was not enough to prevent desiccated plants. There were similar comments about the Plow & Hearth version ($12.95) and while the Gardener’s Supply upside-down planter ($19.95) has a built-in watering system, online reviewers said it is difficult to assemble. In addition to plastic soda bottles, milk jugs and five-gallon buckets, upside-down planters can be made out of thick heavy-duty plastic trash bags, plastic reusable shopping totes, kitty litter containers, laundry hampers and even used tires. Web sites like Instructables.com and UpsideDownTomatoPlant.com show how it can be done, and YouTube has several how-to videos. Variations include building a water reservoir either at the top or bottom of planters for irrigation, cutting several openings in the bottom and sides for planting several seedlings and lining the interior with landscape fabric or coconut fiber to help retain moisture.